Company contribution margin (Net sales minus variable cost) expresses profitable sales and is the preferred measure of TOC (theory of constraints). 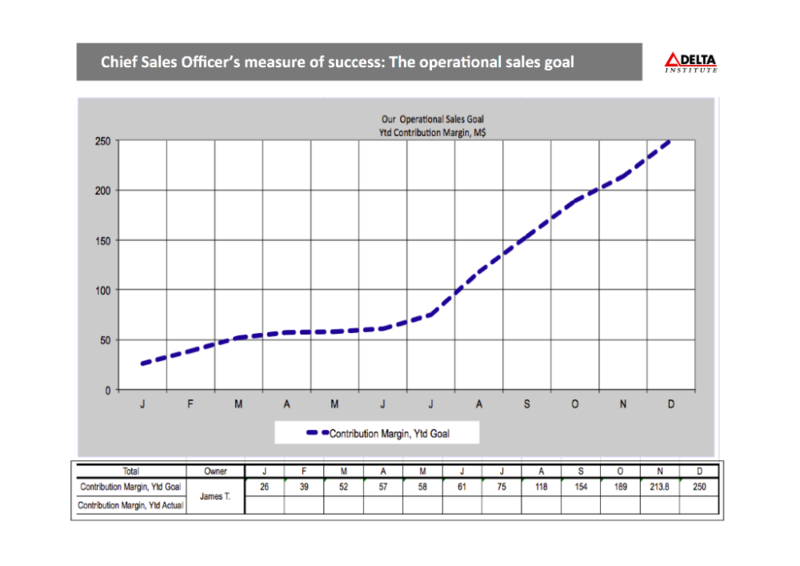 This goal makes the Chief Sales Officer accountable for both net sales and variable cost. Net sales (the first item in the company income statement) is the amount of invoices sent to customers. This measure does not cover the condition "profitable", which we need to add in form of other measures. This measure positions the sales functions as cost item in product lines' income statement. Accountability for variable cost lies elsewhere in the company. As efficiency measure for sales functions we often find CPOD (cost per order dollar) or MCE (marketing cost envelope) per product line. For constraint-focused operational leadership this alternative can work well: constraints are easy to spot and the impact of resolving them leads to increased order volume. An example for this alternative is "Number of machines sold". This measure is difficult to link to company contribution margin. Constraints for selling units are easy to spot, but: are we doing any good for the overall company contribution margin by resolving these? This alternative means for instance: for the company to set the operational goal as contribution margin, for sales managers as order $ booked, for sales professionals set goals in unit sold. For constraint focused operational leadership this alternative is not practical, as resolving individual constraints will seldom result in improving company contribution margin. If your measure of success is not agreed to or is not strongly linked to the company measure os operational success (for instance contribution margin) you cannot demonstrate your contribution and will be considered a failure in your job. Achieve unconditional agreement with the entire C-level management team and the board on your measure of success. Recommended alternatives are net sales, contribution margin or orders booked. You may be requested or tempted to measure your success in a "to do list" of actions. (Many ads offering jobs for Chief Sales Officers do the same). This mistake mixes up "what to achieve" (the operational sales goal) with "how to get there" (the actions). This chart shows your measure of success as cumulative line graph. With unconditional agreement to this chart your measure of success is defined clearly - both for yourself and everyone else in the company. Perfect success is easy to show: always above the goal.